Am I the only one who has never been a huge fan of over-the-top sugary candy bars and hard candies for Halloween? As a little kid and even now, the excitement of Halloween was more about getting to pick my costume, to play make believe and truly believe in magic, and to stay out late with my friends for one night of the year! I get quite nostalgic when I come across old Halloween photos -- like one of my mom in a Frankenstein's monster mask trick-or-treating with me in 2nd grade -- or think of the time that my friends made a surprise stop by my house in costume when I was too sick to go trick-or-treating. I cherish the memories of running around with those friends and counting then trading our many "treasures" at the end of the night much more than any of the candy itself. That being said, there would be no "trick-or-treat" without the treats! But now that I'm older and wiser =p, my taste in candy leans more toward healthier options that incorporate fruits, nuts, dark chocolate, etc. Certainly these are still indulgences, but why can't indulgences be a bit nutritious as well? If you're nodding your head in agreement, you're gonna love my Healthier Halloween Candy Giveaway! I've worked with Temptation Candy to develop a more health-conscious candy basket full of organic and natural treats for ONE lucky reader! These would be perfect for handing out to kids on The Big Night, but I also promise not to tell if you decide to keep them all for your own enjoyment ^_^. TO ENTER, do as many of the following as you want and leave a separate comment for each thing you do! Please also make sure to leave an e-mail address for me to contact you if you win. The giveaway is limited to mailing addresses in the continental US and will close on October 20 at midnight; the winner will then be announced shortly thereafter. Leave a comment that you'd like to win this giveaway. Like Temptation Candy on Facebook, then leave a comment telling me you did or already do. Follow 6 Bittersweets on Twitter, then leave a comment telling me you did or already do so, including your Twitter name. Tweet about this giveaway, tagging me @6bittersweets, then leave a comment telling me. Posted by Six Bittersweets at 11:00 PM 52 comments so far. Add your own? Earlier this week, I completed my first planned food shoot in over a year (for this post) and it was quite terrifying to start shooting again without knowing whether the old skills/sensibilities would flow back naturally or if the learning would be from scratch. In the end, it was a bit of both, with the added challenge of adjusting to the lighting in a new apartment. I realize professional photographers must constantly adapt to diverse settings for their shoots (among the many reasons that I respect them so and that I'll never be a pro lol!). I, on the other hand, am accustomed to quite the opposite: transforming the same environment into 20 different ones so my photos don't all blend together. If any of you have tips for readjusting to food photography/blogging after a long break or after a big move, please share them with me in the comments below! Another topic on my mind this week has been the interaction between individual innovation and external inspiration from the work of others (such as the photos I share in these favorites posts). One of the reasons I enjoy perusing beautiful food photos is that different photographers can approach the same subject from drastically different angles. In the best circumstances, seeing such varied takes on the same subject helps me break out of a creative box I may not even realize I'm in. That's the best and desired outcome. Yet there's also the possibility that focusing too much on the work of others will simply impose new blinders that anchor your creativity to the ideas of another artist. I know I'm not the only one to feel this way. For example, I once read an article from a cake artist who avoided looking at other cake art so that she could ensure that her designs would be part of a unique, personal style. What do you guys think? Not just for food or photography but for any form of art, do you feel it's more helpful or harmful to look at other people's work while also developing your own? P.S. - Just want to make sure everyone knows that the photos I feature still link back to the source/creator if you click on the image. One of the main reasons I make these favorites posts is to direct more traffic to deserving artists, so I'd hate for people not to realize the links are there. Enjoy! Roasted Spiced Pumpkin Salad with Tahini Dressing from The Food Dept. Posted by Six Bittersweets at 10:00 PM 5 comments so far. Add your own? Hello world! These are my baby steps back into the food blogging/photography world. A little scared...a lot clumsy (I swear I've somehow forgotten even the basics of how light works! =X)...and learning things again bit by bit (I hope) with each attempt! For today's shoot, I chose coconut cassava bars inspired by one of my favorite nutrition blogs, Nutrition to Kitchen. Similar versions of this cake can be found in Vietnamese and Filipino cuisine. These bars are mildly sweet and just a little bit salty (partly due to the addition of cheddar cheese! 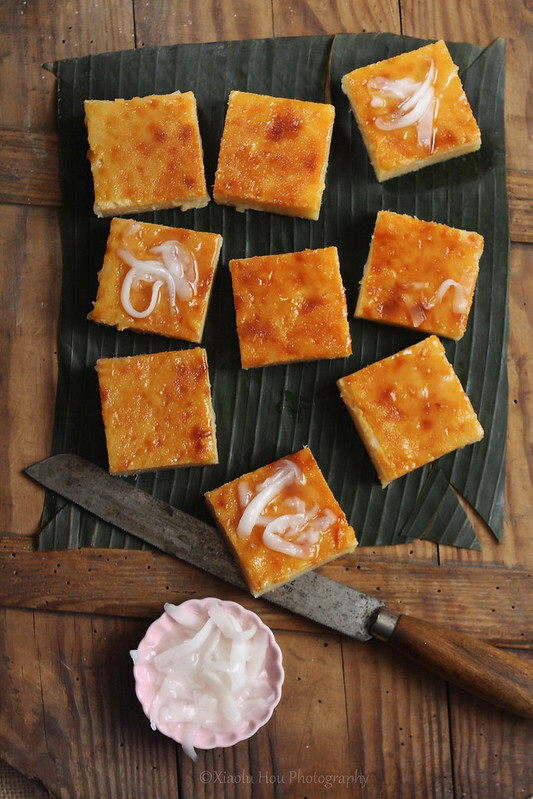 ); soft and chewy in a way that's reminiscent of mochi cake (not surprising once you learn cassava is used to make tapioca); rich with coconut flavor (from the milk as well as sweetened coconut strings known as macapuno); naturally gluten-free; and ab-so-lute-ly addicting to nibble on. Please do give it a go, and let me know what you think! Posted by Xiaolu at 11:30 PM 11 comments so far. Add your own? Wow. Can you believe it's been over THREE months since I last updated 6 Bittersweets?! No? Me neither. But somehow...despite my best efforts to keep the posts trickling in, the speed of life simply overtook my commitment and capacity to blog in the past few months. How do those of you with kids and/or more than one job do it? How and with what black magics? Seriously though, you guys are amazing and I have more respect for you all now than even before. But the other, wonderful side of this coin is finally setting foot on my chosen career path and so much more. For those who've never been here, the VT university campus and surrounding region is bursting with natural beauty. After living near the city, it's glorious to see so much green (the campus, the mountains, our yards!). While we no longer have large malls at our fingertips, I'm already excitedly planning excursions that bring us closer to nature such as hiking, tubing, and picking fruit. As I ease myself back into regular blogging (this post is the 1st small step), I hope to share images from these parts of my life in addition to what comes out of my kitchen. Speaking of the kitchen, the one in our new apartment is more than twice as large as our previous. Anyway, before I get too carried away, my point is that I was gone for a while but NOT gone for good. I'm starting a new chapter of my life in a big way, and I'm bringing my readers with me if you'll still have me! Posted by Six Bittersweets at 10:30 PM 4 comments so far. Add your own? I've always enjoyed eating pies, but they've never consumed my daydreams the way cupcakes and macarons have. Perhaps its their rustic appearance and less portable/adorable packaging. Or perhaps its the added step of having to make pastry dough in advance (a pie without a homemade crust is not a pie worth making IMO). Either way, my thoughts rarely turn toward pie unless autumn's on the horizon. At least that's how it used to be until an unassuming slice from the aptly named Dangerously Delicious Pies (DDP) in DC blew me away at first bite. Its name was The Baltimore Bomb, and I guarantee it's like no pastry you've ever tasted. DDP created The Bomb especially for the city of Baltimore, Maryland, using their famous Berger cookies, which are equal parts vanilla cookie and chocolate fudge. 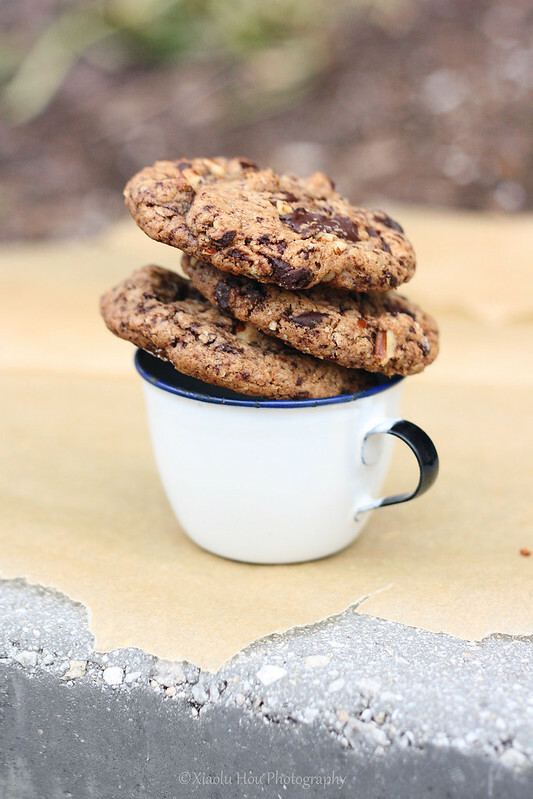 The inspired twist was to suspend these decadent cookies in a traditional Southern chess filling. The fudge melts down to bestow its gooey goodness to the entire pie, while the tangy custard reigns in the richness of the chopped Berger's. 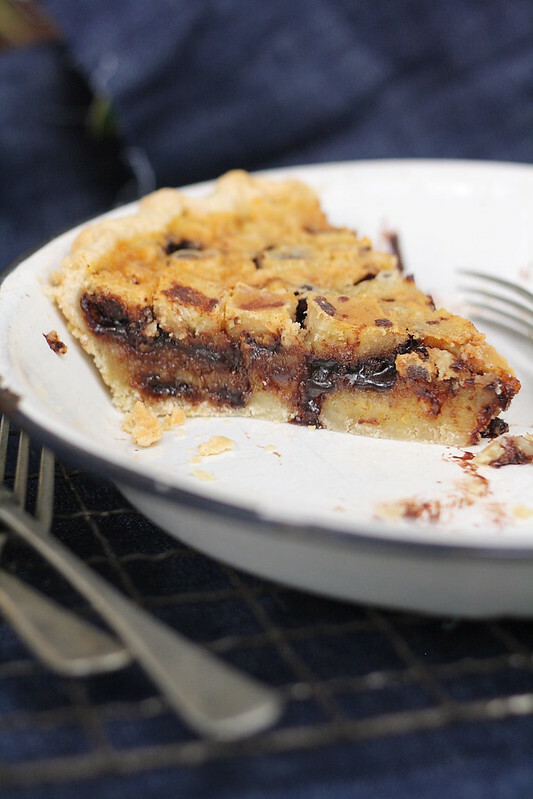 I strongly encourage everyone in the DC area to experience the real deal at DDP, but I think this recipe hits pretty close to the mark and captures all the elements that make the Baltimore Bomb Pie so exceptional and addictive =D. P.S. - Please pardon the mediocre photo! I only had 15 minutes during the workday to grab a shot in front of my office building AND it started raining as soon as I got outside. The taste was fantastic though so I wanted to make sure I had a photo for this blog post to tempt you to try the recipe (please do!). Posted by Xiaolu at 7:30 PM 5 comments so far. Add your own? Posted by Six Bittersweets at 12:30 AM 8 comments so far. Add your own? Hope you all had fun weekends as well. And here are some lovely sounds and images to end it on a high note! Posted by Six Bittersweets at 9:30 PM 7 comments so far. Add your own? Nonetheless, I wanted to share some notes (before I forget!) 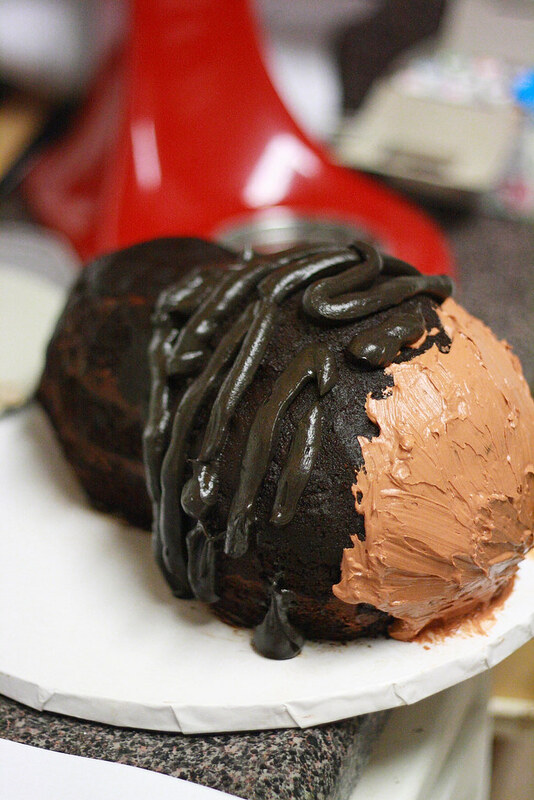 on how I made this cake in case any of you have pig-lovers as friends/family/clients/selves. Wish I'd thought to document the initial cake carving/spackling process, but I'm hoping the 3 pre-buttercream shots below are still helpful. 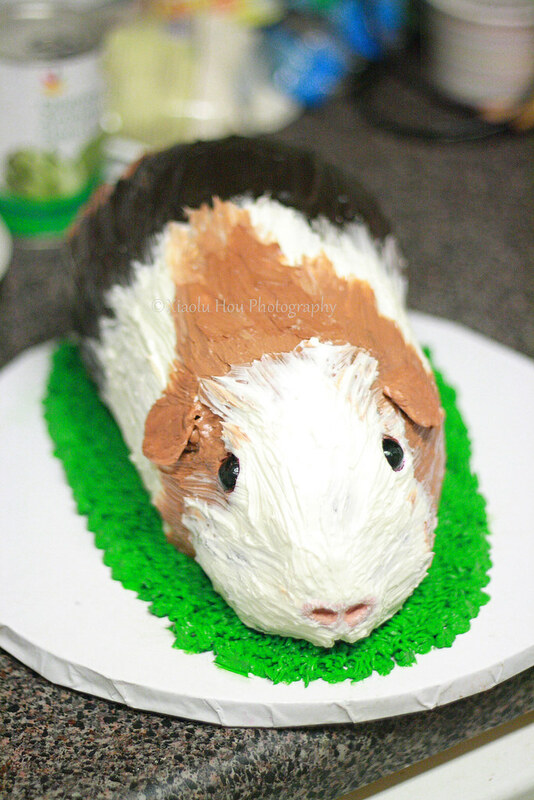 If you have any additional questions about how I made this Wheek-tastic cake, don't hesitate to leave a comment or shoot me an email! 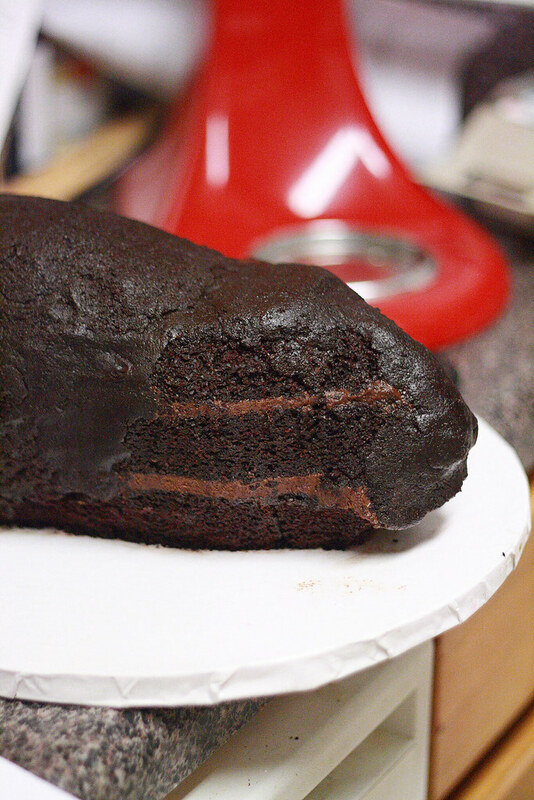 If you find the cake getting too soft to carve well, simply stick it back in the fridge for 10 minutes to firm up again and then continue working. 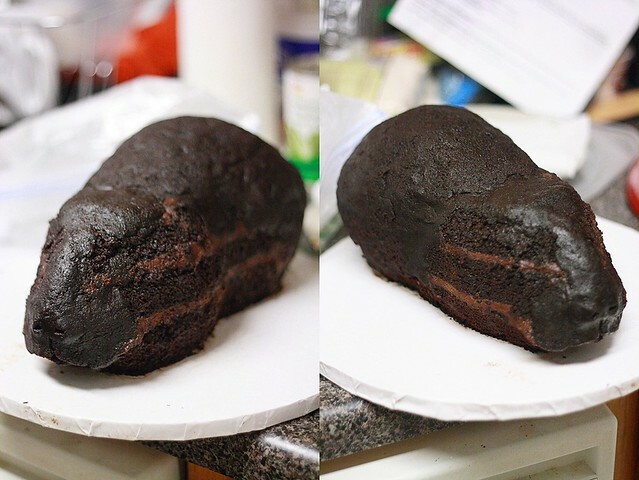 When you're happy with the shape, chill the cake again to set the shape. While you're waiting on that, reserve about 1/2 cup of vanilla buttercream, then divide up and color the remaining chocolate and vanilla frostings to make the shades you want for the fur. I used black gel food coloring to darken chocolate buttercream and a mixture of vanilla frosting, chocolate frosting, and brown and yellow gel colors to create the lighter shade of brown fur on the pig. 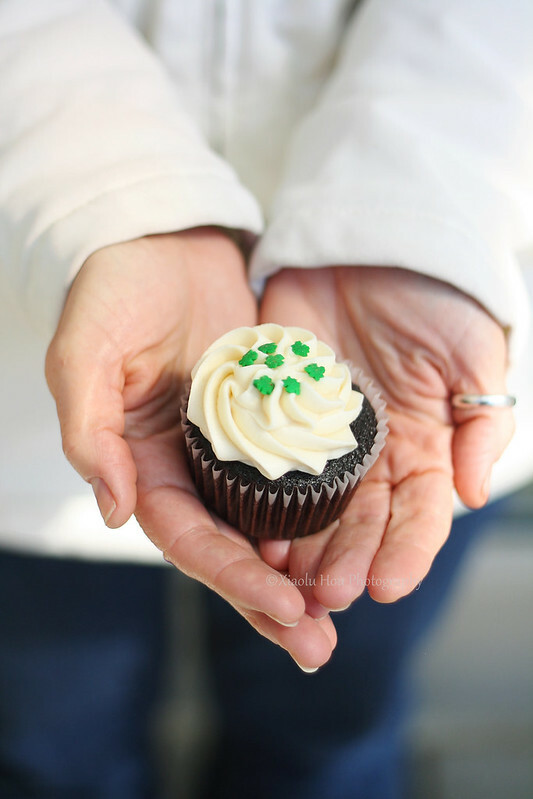 Now's also a good time to color the 1/2 cup of vanilla buttercream reserved above a vibrant grass green for later. I used a combination of gel and powdered food coloring. Cover and set aside for later. Once the cake has been chilled enough, it's time to add the fur-textured buttercream. I spent as much time figuring out the best way to do this as I did studying guinea pig shapes (is it just me or do those both make me sound ultra cool?? and not weird at ALL). The keys to getting a fur-like look with buttercream are (1) to use a paintbrush (one reserved for FOOD use ONLY) with somewhat coarse bristles, (2) to apply the different-colored sections from the back of the cake toward the head, and (3) to wipe your brush off VERY well whenever it touches more than one color at once. Posted by Six Bittersweets at 11:55 PM 14 comments so far. Add your own? Stunning Wedding Cakes (above and below) by Hey there, Cupcake! It's obvious from my favorites posts that I've fallen truly and deeply in love with cake decorating during the past year. One aspect of this creative community that really draws me in is the amount of openness, sharing, and instruction that goes on between professionals and hobbyists, experts and complete n00bs such as myself. This exchange occurs constantly through Facebook, Twitter, Pinterest, countless blogs, and devoted forums such as Cake Central and Cakes Decor. And such support among artists is the reason many of us novice decorators have had the courage to try daunting designs like this extended tier cake I made for my company's holiday party and the carved guinea pig cake I'm about to make for a friend's birthday. Many professional decorators are not only generous with their advice, but are also releasing full tutorials for their coveted techniques (some for purchase but many for free)! It's become a common enough occurrence that I started praying for one from the first moment I saw these stunning Hey there, Cupcake! cakes using die-cut edible paper (above and below photos). Edna De la Cruz of Design Me a Cake turned out to be my knight in shining armor with her tutorial created for Edible Artists Network Magazine. Please check out her step-by-step on using craft punches with edible wafer paper to decorate your cake HERE! This is an especially exciting technique for those of us without Silhouette or other die-cut machines yet don't have the delicate touch and patience to cut these patterns by hand. Any Martha Stewart craft punch will work, and there're so many beautiful ones to choose from. I've already purchased the Double Arches Punch Set used to create part of the Hey there, Cupcake! designs above. The Optic Dot Edge and Deco Shells punches are also on my caker's wishlist but I'm trying not to be toooo much of a shopaholic (for now...). Also, if you're interested in making chic edible paper flowers like those in the top photo, Paul Bradford offers a tutorial for similar flowers as part of his online Sugarcraft School (£9.95/month). I hope at least some of you find these tutorials as interesting as I do, and Happy Caking to all of you! Posted by Six Bittersweets at 12:00 AM 4 comments so far. Add your own? I know Mardi Gras was technically yesterday, but can you really blame me for wanting to keep the party going? I made these King Cake^2 Pops for a birthday celebration at work today. And based on 100% statistically sound exit polling, these treats would be a welcome offering year-round =p. The filling is a 6 Bittersweets original cake full of sour cream, raisins, cinnamon, nutmeg, and cream cheese. Dressed up in a slim candy coat and sparkly colors, these are my most party-ready cake pops yet! 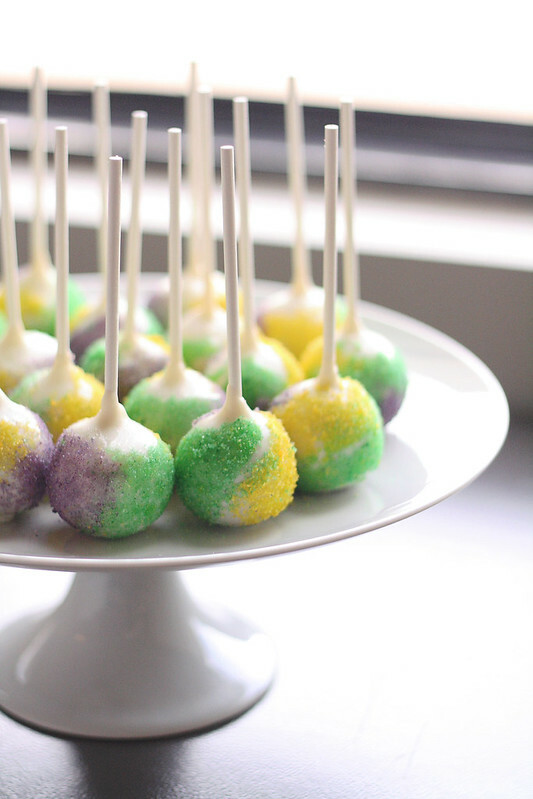 I suggest you grab on to any excuse you get to make these, whether it's Mardi Gras, a birthday, or even just Hump Day =). Posted by Six Bittersweets at 10:00 PM 3 comments so far. Add your own? I'm a bit short on time today as I've got work work as well as some baking work to do tonight on top of being on the tail end of the bug that finally caught up to me this weekend. Hope you guys had a better weekend, and take a few minutes to feast your eyes on the work of the incredibly talented folks below! Posted by Six Bittersweets at 7:00 PM 1 comment so far. Add your own? In light of some heavy news both P and I have gotten about our grandparents in the last few weeks as well as in light of Valentine's Day this week, I thought I'd post one of my favorite songs from the new Tegan and Sara album, Heartthrob, that's keeping me upbeat =). Hope you all had a great weekend! Posted by Six Bittersweets at 7:57 PM Be the first to reply! Thanks to everyone who entered the Sucré King Cake giveaway! The randomly selected winner is Athena of Athena Plichta Photography (comment #42)! Congrats and please look out for my tweet and email me your mailing address ASAP! I rarely use the word "perfect", and never in reference to my own baking (being my own worst critic and all...). It's a term too often used to describe the generic and mundane rather than the extraordinary. But it's also incredibly subjective with meaning that varies as much as the individuals that use it. 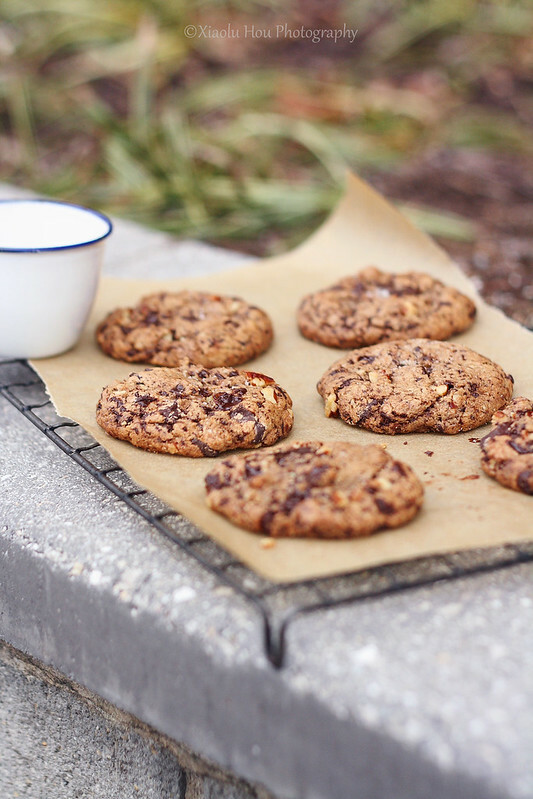 So when I tell you that the GIF below is 100% how I reacted to my first bite of these thick and chewy gluten-free chocolate chip cookies, I want you to understand that I'm not using the word frivolously =D. And lest you think this an exercise in self-congratulations, I openly admit to making only minor tweaks to an already incredible recipe by Alanna of Bojon Gourmet. While I'm aware on some level that multiple types exist, the only CC cookies that my brain registers are crisp around the edges, chewy in the center, oozing with melted chocolate chunks, and bursting with a flavor akin to butterscotch. All of us who share this concept of Cookie Nirvana as well as an interest in gluten-free baking owe Alanna a huge debt of gratitude. 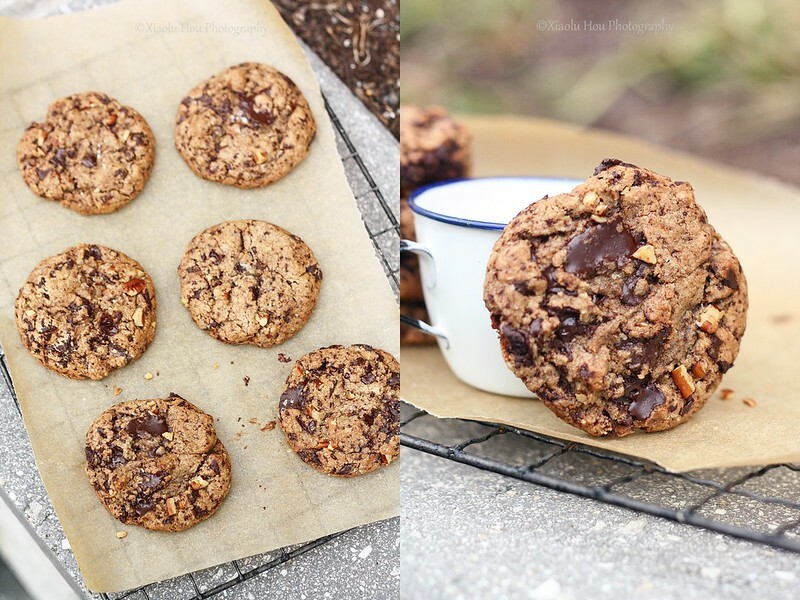 With some slight tweaking of the types/proportions of grains, she's created a GF cookie that stays chewy in the center, spreads like a wheat cookie, and is equal or superior to any CC cookie I've ever tasted (conventional OR GF)! For you skeptics out there, know that all my guinea pigs coworkers loved these, and not one could tell they were gluten-free. In this day and age I'm willing to bet that most of you have had reason to contemplate gluten-free cooking. 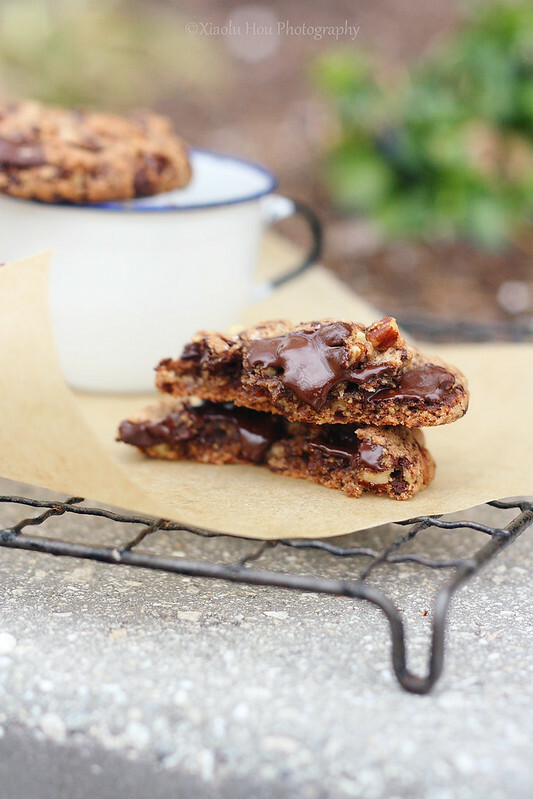 Whether you're baking for a friend with celiac disease or just experimenting with alternative grains, I'm confident your search for The Best (Gluten-Free) Chocolate Chip Cookie will be over as soon as you whip up a batch of these. And being a gift that keeps on giving, I wouldn't be surprised to see other GF cookie posts popping up soon using this base as the starting point...I truly hope you enjoy this "perfect" recipe as much as I have and would love to hear about your results if you try it! Posted by Six Bittersweets at 10:45 PM 19 comments so far. Add your own? Posted by Six Bittersweets at 3:00 PM 7 comments so far. Add your own? It turns out that Sucré, whose French macarons I've been coveting for quite some time, also makes a killer King Cake (a must at any Mardi Gras celebration!). It's gotten praise from The Times Picayune, Washington Post, and New York Times, among others. If you're among the uninitiated, a King Cake consists of buttery sweet danish pastry filled with cinnamon and cream cheese then topped off with a vibrant array of colored sugar. A trinket (usually a small plastic baby) is also put in each cake. The person who finds it is then dubbed King or Queen for the day and said to receive good fortune for the year! That person then has the duty to pay it forward by throwing another party and serving a King Cake. How. Fun. Is. That?! So the point of all this is that Sucré has generously offered to provide one of their award-winning King Cakes (feeds 8-10) to one lucky 6 Bittersweets reader just in time to throw your own local mini-Carnival! This giveaway will remain open for 5 days and is limited to addresses in the continental US. To enter, do as many of the following as you want and leave a separate comment for each thing you do! Please also make sure to leave me your email address to contact you if you win. The giveaway will close on Tuesday, February 5, at midnight, and the winner will be announced shortly thereafter! This giveaway has ended -- thanks to all who entered! Tell me your favorite New Orleans, Mardi Gras, or King Cake experience if you've had one. Visit Sucré's online store, and share your favorite treat in the comments. Like Sucré on Facebook, then leave a comment telling me you did so. Follow Sucré on Twitter, then leave a comment telling me you did so. Tweet about this giveaway including a link to this post and tagging @6bittersweets, then leave a comment telling me. P.S. - Don't like relying on the whims of Lady Luck? Sucré will take/ship out orders of King Cakes until February 11, and don't forget to check out their nommy macaron selection too while you're there! Posted by Six Bittersweets at 11:50 PM 59 comments so far. Add your own?